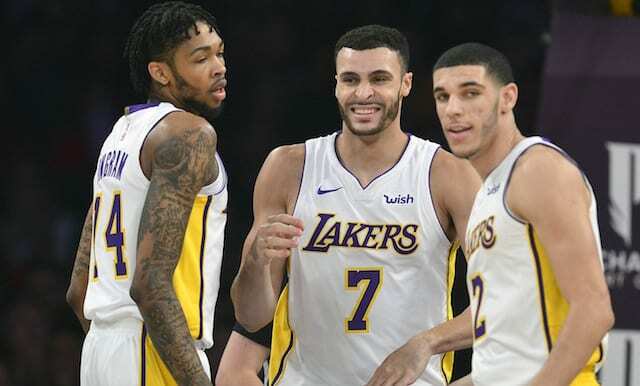 The Los Angeles Lakers made headlines on Thursday by trading Jordan Clarkson and Larry Nance Jr. to the Cleveland Cavaliers in return for Isaiah Thomas, Channing Frye and a 2018 first-round draft pick. The deal was financially motivated, as the Lakers have cleared another hurdle for potentially doling out two maximum contracts this summer, when the likes of LeBron James, Paul George and DeMarcus Cousins are set to become free agents. During his time with the Lakers, Nance anchored the second-unit’s defense and routinely made the highlight reel with his prolific dunks. The 25-year-old’s move to Cleveland marks a homecoming, as Nance was born and raised in the area. Furthermore, his father, Larry Nance Sr., spent seven successful seasons with the Cavaliers, where he was selected to two All-Star Games. Nance will return to Staples Center next weekend to participate in the Slam Dunk Contest, and he’ll surely receive a loud ovation from Lakers fans in attendance. The Cavaliers face the Lakers in Los Angeles on March 11.